It was good to get away from my day job last week. I spent my days off seeing patients and intentionally not checking my hospital email account. I’m aggravated at how things are going with our upcoming EHR migration and how my team is being treated, so I thought unplugging would be therapeutic. Initially we were told that our team would be transitioned to the new project and placed in similar job roles. Our ambulatory group continues to acquire new practices and a small team would remain to continue implementing at those sites as well as to support existing sites. We communicated this to the team and they were comfortable with the approach. About a month ago, the plan changed. Leadership decided that they want to structure the team more consistent with what the vendor recommends. Now we’re looking for a fairly large number of project managers and plan to hire a completely new training team. I’m reading between the lines and thinking that perhaps they don’t want people with experience because they’re worried about preconceived notions of how an implementation should look. New trainers will certainly be easier to mold to a new paradigm, but I have serious concerns about throwing away as much cumulative experience as our team has. In addition to being solid trainers, they understand our physician base and how our offices run. The offices trust them and see them as advocates. Before I left for vacation, our leadership informed the staff of this new plan and essentially told people to get their resumes in order. If they want to move to the new project, they will need to apply for the project manager positions. Most of my team members thrive on the front lines and on working directly with users. If they had wanted to be project managers, there have been quite a few opportunities during the last couple of years. On the other hand, they don’t want to be stuck turning the lights out on a dying project and risk being let go at the end. Because of flip-flopping by the leadership, the team is nervous and scared. At this point, I don’t know what to tell them. I’m still in limbo regarding my own position. I’ve seen at least half a dozen variations on the proposed clinical leadership structure and none of the positions have jumped out at me as being a good fit for my particular skill set. Like the team, I’ve been told to get my resume in order. Once the positions are posted, I can apply along with the rest of the CMIOs that are being consolidated. We’ll have three days for internal candidates to apply before the positions are posted externally. It goes without saying that they’re going to hire a new system-wide CMIO who has experience with our new vendor, so at least we’re not all fighting each other for the top job. Postings are supposed to go up next week, but they’ve already been delayed several times, so I’ll be surprised if they are there before HIMSS. Once I see what is available, I’ll make my final decision on whether I’m going to stay or fly the coop. Most people find uncertainty to be disconcerting. For me, it’s been somewhat liberating because I’ve given up on trying to figure it out. This might be the first time in my life that I haven’t had a plan. I’m starting to understand how my colleagues that fly by the seat of their pants feel every day. After my week off, I came back to work much more relaxed and ready to see what the next curveball might be. We’ll see how long that lasts, based on the craziness that we’re thrown on a daily basis. In the mean time, there’s always room for pastry therapy. 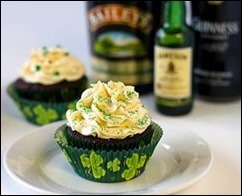 In honor of St. Patrick’s day I made some outstanding cupcakes that a friend had suggested I make. I just may have found my new favorite buttercream frosting recipe. Slainte! The vendors are putting the cart before the horse, to control the message and manipulate the hospital bosses. If you complain, they will take your neck, if your vendor and vendor hospital $$$$ flow is typical.